Previously, on MinerBumping... The fate of highsec miner masterstarkiller was balanced on a razor's edge. When Agent Alt 00 did him the courtesy of destroying his illegal Retriever, she also offered to solve his many problems by selling him a mining permit. The choice masterstarkiller made in the next few moments would have the potential to change his life forever. 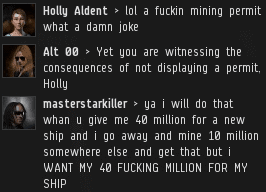 The miner was still obsessed with the 40-ish million isk he'd lost. He couldn't imagine himself earning even 10 million for a permit, unless he got 40 million back first. For some reason, masterstarkiller was utterly convinced that the person who'd just ganked him was now going to turn around and give him money. If he used enough ALL-CAPS, that is. It was time to reset the conversation. 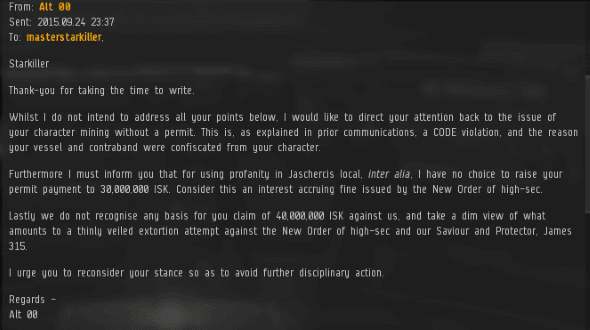 Alt 00 needed to demonstrate to the miner that the world didn't revolve around his petty demand for 40 million isk; it revolves around the Code. Earlier, Hector Briggs had been put on notice. He'd borne witness to the whole masterstarkiller drama. Yet he continued to mine illegally. Our Agents are expert multitaskers, so Alt 00 had no problem ganking his Retriever and podding him. So much for the "if you warned me, I would've paid" argument. 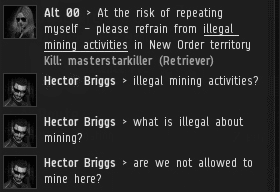 Our Agent's smashing PvP victory against Hector proved once and for all that no highsec miner could escape New Order rule. masterstarkiller could only accept the situation and show deference to his superiors. ...Or he could go nuclear in local. Jaschercis local watched, horrified, as the miner revealed the full extent of his Goofusness. The stoic Agent weathered another storm of tears. Eventually, despite his continued demands, masterstarkiller came to the realization that he might not be getting his 40 million isk reimbursement after all. He sent an EVEmail to Alt 00 expressing his sincere disappointment. Alt 00 made it abundantly clear that the miner would not receive any money; the New Order frowns upon extortion attempts by miners. 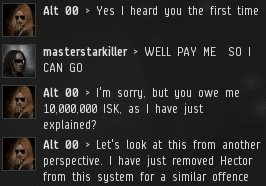 masterstarkiller finally abandoned his claim for 40 million isk, and comforted himself as best he could. Alt 00 sent him an EVEmail with her final words, and wished him well. The story has a happy ending. 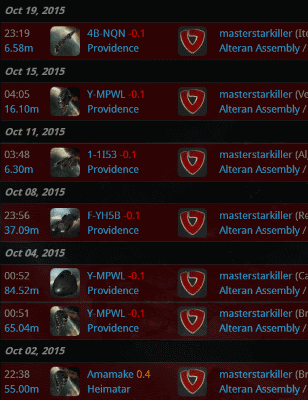 According to masterstarkiller's character killboard, he left highsec for good. He somehow managed to make money from a source other than begging our Agents for it, and he even tried his hand at PvP. Though he wasn't good at it, he at least made an effort. 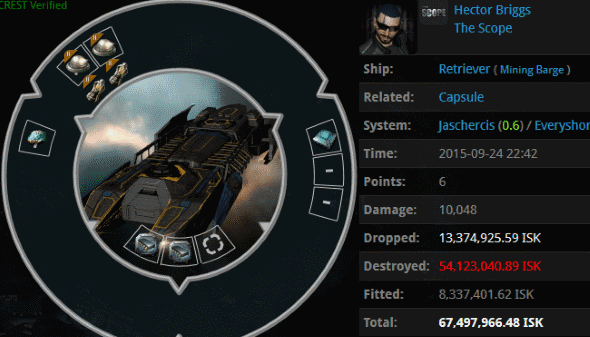 Now the former highsec miner had a chance at enjoying EVE. At the very least, he no longer poisoned the highsec community. My friends, that's how it's done! I admire your self criticism, Anon 5:49. Anon@5:49 - Your comment is. Literally. 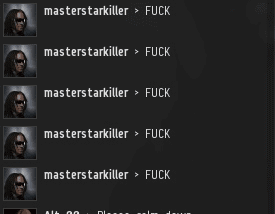 Carebears are the ones trying to extort honest players. This made me laugh. Good stuff! Another complete victory for the New Order! Once again... The CODE wins! Glorious! Simply glorious! Whatever happened to those guys who were claiming to kill a bunch of GSF and "kick them out of pureblind". Mordus Angels or something? I tried to find them in the top lists for zkillboard but maybe there is a bug. he he he! Thats one pissed off crybear! "I STILL WANT MY 40MIL AND I WILL GET IT WHEN I LEARN HOW TO PVP." You may be waiting a very long time to see that 40 mil. The Code always winning, always ! !